My poor blog. I need to find a rhythm again. Soon. In the meantime, here's a segment that ran April 28, 2013 on Mormon Times. The first two minutes aired last November, but the remaining interview is new. On March 2, we traveled to California for a long-awaited family vacation. Our 10-year-old Miniature Schnauzer, Mary, had exceeded the two-month prognosis she was given in early December after being diagnosed with brain tumors. I found a compassionate-care animal hospital to watch Mary while we were away. Our goodbye was longer than normal when we dropped her off, just in case. She was thin—usually 17 pounds, down to 9—and rested a lot, but she didn’t seem to be suffering. Mary looked forward to her meals and loved affection. I believe simply watching our family move about the house from her bed gave her comfort. She appeared content. It could have been any day…maybe even weeks or another month. We were at the San Diego Zoo, four days into our vacation. An elephant was about to receive a pedicure. One zookeeper explained the procedure while another worker prepared the area before retrieving the animal. The worker placed a stool, an elephant-sized nail file, and a bucket of cucumber treats in the pedicure area. The bucket had the name of the elephant written on the side. Her name was Mary. We made the decision to euthanize Mary later that afternoon. Sea World, Legoland, the beach, and being away from home—all buffered our grief. Family vacations are important, pets die; this is life. Re-entry was rough. We drove home from the airport recapping highlights, feeling thankful for a fun 10 days, but anxious to sleep in our own beds. At the same time we were heavy-hearted about the reality of seeing an empty dog bed. Mary was cremated. A few days after we returned, I picked up her remains along with the pink sweater she was wearing the day we left. I placed her in the front seat of the car next to me, cried hard, told her I loved her, and that I needed to swing by the liquor store before we went home. She waited patiently. We know that it was “time”, and that there was no chance of recovery. But, of course we miss Mary and feel her loss in powerful and unpredictable waves. Pet grief is unique. Chris, the boys, and I spread her ashes in the backyard after a short, awkward family memorial. The day was windy. It didn’t seem to matter which direction we sprinkled, the wind always shifted, blowing the light grey powder back towards the person sprinkling. Mary clung to us. She even got in Redmond’s (7) eye. Damn dog. Rest in peace, sweet Mary. Here is a piece that I wrote for a local online newspaper -- The American Fork Citizen. And a piece for LDS Living. 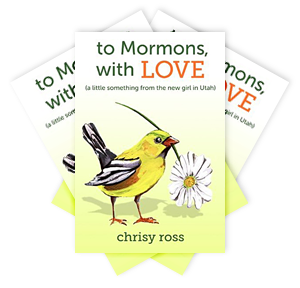 I appeared on a local television show, Studio 5, in a segment titled, Breaking the Mormon Code. The piece is 12 minutes long, and the live discussion begins after three minutes (although I encourage you to watch the pre-recorded sound bites if this is a topic that interests you).